Understand what makes a good ad. Integrate your ads’ appearance with the rest of your site. Make sure customers can easily distinguish ads from content. Keep ads relevant and appropriate. Understand how your customers interact with ads. Provide ads for internal merchandise instead of third-party advertising. Pay special attention to ads on pages that appear if there are no search results. A good ad is concrete and to the point rather than full of generic, marketing jargon. These findings apply to both typical search results and third-party ads. Thus, a good ad is concrete and to the point rather than full of generic, marketing jargon. For example, it might present a picture of the actual item being advertised or indicate clearly that there’s free shipping rather than saying something like We have thousands of cheap items in stock! As shown in Figure 1, the ads on Cars.com are actually pretty good. 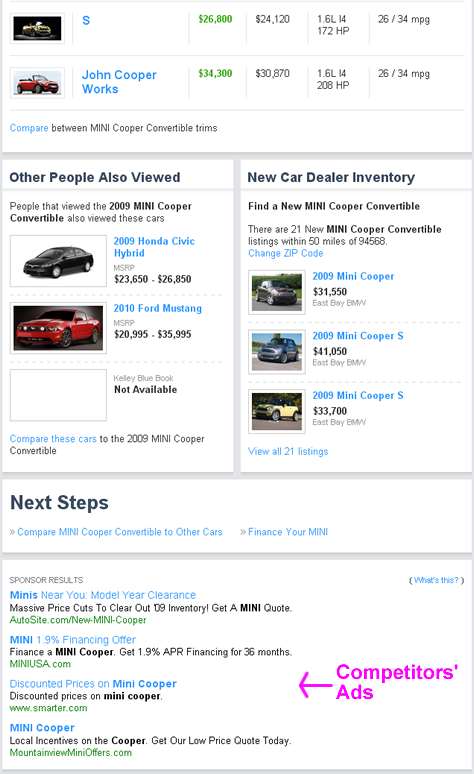 This ad on Cars.com follows an important principle: It is highly relevant to the search results on the page, calling customers’ attention to the specific item in the search results. Even though the ad at the top of the page is a banner ad, it doesn’t have the drawbacks of typical banner ads—such as presenting irrelevant content or being positioned too far away from the main content. The price quote, showing good value, is prominent and provides a good call to attention. The presentation of the ad is very straightforward, with concrete information and little marketing language or visual noise. Is it enough that an ad’s content be appropriate? While content is important, it is just one aspect of the marketing message. Another important principle of ad appropriateness is keeping an ad’s style appropriate to the topic. Contrast the style of the Cars.com ad to the ad on the Yahoo! 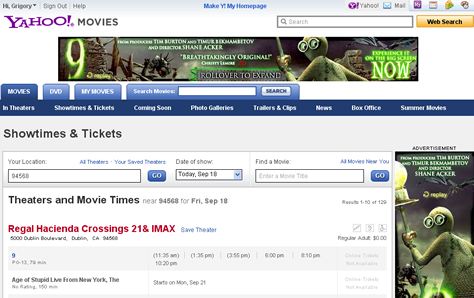 Movies page, pictured in Figure 2. Even without seeing the flashy animation, it is clear that the ad is quite vibrant. The way an ad is presented matters a great deal in how customers perceive both the ad and the site hosting it. An ad with this animated style is highly appropriate if we expect customers to be getting ready for an action-adventure movie experience complete with special effects. In this case, tasteful, yet somewhat loud movie ads, providing links to previews, are not only appropriate, but expected. This example shows how carefully chosen ads can form a large part of a Web page’s useful content, making it unnecessary for Yahoo! to work so hard at keeping the page exciting. The ad in Figure 2 calls out a specific item within a set of search results that appears on the page. When it comes to hosting ads, it definitely pays to get creative. In our research, we learned that the way an ad is presented matters a great deal in how customers perceive both the ad and the site hosting it. 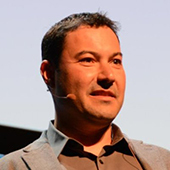 Creative, interesting presentations get extra points, especially if they are unobtrusive. 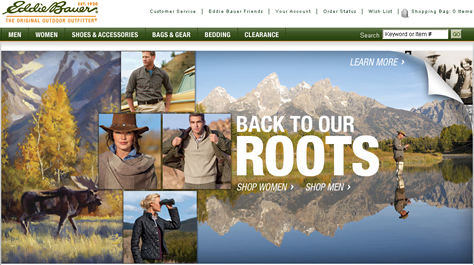 For example, the peel-the-corner ad on EddieBauer.com, shown in Figure 3, is a great example of an ad that draws attention and invites participation, without obnoxiously dominating an experience. Passive ads … do not invite customers to click, so much as capture eyeballs, with the purpose of instilling a subliminal desire to select a specific item among many that a site offers. Anecdotal evidence suggests that most people do not mind interacting with this kind advertising and consider peel-the-corner style ads acceptable or even positive on a wide range of sites—if the ads contain appropriate content. What kind of customer action should an ad invite? 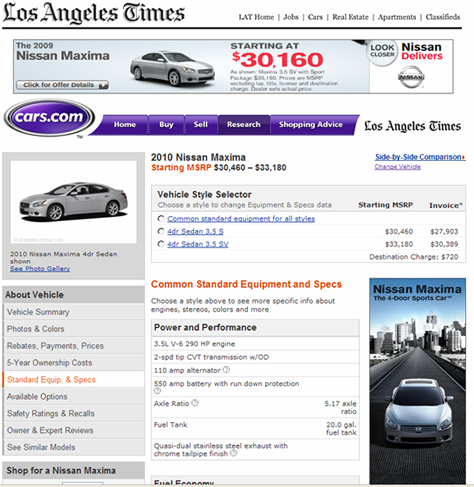 In Figure 1, the ad on Cars.com asked customers to purchase or consume a specific item on the same Web site—for example, purchase a Lexus. The ad in Figure 2 invited customers to participate in an offline interaction they will perform after viewing the ad—see a movie after reading a movie review and referring to a theater schedule on Yahoo! Movies. These are both examples of passive ads—that is, they do not invite customers to click, so much as capture eyeballs, with the purpose of instilling a subliminal desire to select a specific item among many that a site offers. This mirrors a classic bricks-and-mortar advertising strategy, in which certain companies pay stores to feature their brands on banners and place their products in prominent locations. However, the Web is a very dynamic medium, leading to all sorts of novel advertising models. One advertising model involves carrying your competitors’ ads, advertising similar products for sale on a different Web site or in another store. On the one hand, customers’ clicking these ads generates marketing revenue. On the other hand, this marketing revenue literally eats into the sales revenue from products and services your Web site provides. Thus, competitors’ ads cause what is known as cannibalization. Generally, carrying competitors’ ads is a dangerous and losing proposition, because cannibalization involves many hidden costs that are often hard to quantify. Generally, carrying competitors’ ads is a dangerous and losing proposition, because cannibalization involves many hidden costs that are often hard to quantify. Most companies spend a lot of money on advertising, to bring customers to their own Web sites. If customers click a competitor’s advertisement, not only is there an opportunity cost—because those customers do not buy your own service or product—there is also a hidden cost—you’ve wasted your marketing dollars. Some sites understand their customers’ reluctance to do extra work and consciously decide to exploit this fact by hosting competitors’ ads—boosting their revenue without much cannibalization of their own sales. making competitors’ ads look like advertising—Customers deliberately ignore such ads, and they get very few clicks. This strategy works great if you get paid for ad impressions, not by the number of clicks. carrying only ads for weaker brands—This limits the number of customers who click away from your site. not allowing ads to display competitors’ prices—Displaying the actual prices for specific competing goods or services encourages customers to click ads. The competitor ad on Yahoo! Cars, shown in Figure 4, provides a good example for all three of these strategies. Another interesting strategy involves completely embracing the experience of offering the best marketplace price from whatever source and being fully committed to always carrying ads from various competitors. Your site has the best price. Differences in price are not significant. Competitors’ prices do not give a complete picture—for example, items for sale are used or have high shipping costs, but their ads do not communicate these details. 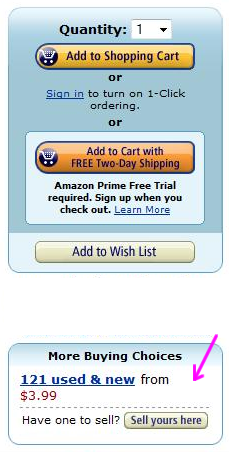 Amazon.com uses an interesting variation on this strategy, carrying the same items from both Amazon’s own store and their online marketplace, as pictured in Figure 5. Having a marketplace also benefits consumers by providing multiple, highly relevant shopping options without presenting anything that looks or feels like an ad. This is a win-win situation for both Amazon and their customers. Amazon collects rich fees from sellers in their marketplace, so they make money regardless of which items customers purchase. Having a marketplace also benefits consumers by providing multiple, highly relevant shopping options without presenting anything that looks or feels like an ad. This strategy is very tricky, because Amazon is essentially competing with their own sellers. However, despite the challenges, this strategy has been quite successful—in large part because Amazon has been very proactive, constantly adjusting their price points and the inventory of items they carry to keep their marketplace thriving and provide customers with the comfort of knowing they are getting very good prices from a brand they trust. control—No matter how carefully you screen third-party ads, undesirable content sometimes slips through, harming your brand and sending your hard-earned customers to your competition. visual design—Despite your best efforts at ad customization, third-party ads look like, well, ads. On the other hand, you can fully integrate merchandising into your site, make the best use of your available space. specificity—Third-party ads are often not very specific to a site’s own products—nor would you want them to be, because that would drive your customers to the competition. On the other hand, you can make merchandising as specific as necessary, because in this case, all ads ultimately drive traffic back to your own site, where transactions convert directly to your bottom line. Merchandising simply offers a better user experience. People like specific, targeted content that does not look like an ad, but helpfully provides ideas and choices. When there are no results, search results pages are an especially dangerous place to host advertising. When there are no results, search results pages are an especially dangerous place to host advertising. All of the negatives of displaying competitors’ ads that we discussed earlier become further exacerbated on a no search results page. Such a page is generally devoid of your own content, making third-party ads their primary calls to action. As I described in my earlier column “Starting from Zero: Winning Strategies for No Search Results Pages,” no search results pages indicate to customers they’ve over-constrained their query and need to reformulate or broaden their search. 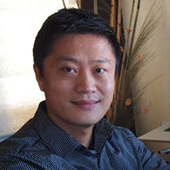 Displaying third-party ads on a no search results page invites customers to abandon their natural behavior of iterative search in favor of following a fresh information scent. This interrupts the finding flow on your site and dumps your customers directly into your competitors’ greedy hands. Unfortunately, marketing folks often simply fail to grasp the iterative nature of the finding process and the critical role the no search results page plays in helping customers reformulate their queries. Some of them like to put ads on no search results pages, justifying their viewpoint by saying something like this: We are simply meeting the customer’s needs with our ads. The customer would leave our site anyway. We are just helping him and making some money along the way. This thinking demonstrates a dangerous and fundamental lack of understanding of the differences between how search engines and ad-hosting services should work. Search engines that are internal to a Web site typically combine keywords, using an AND operator. Thus, they look for items or content that contain all of the keywords a customer provides. This practice often leads to over-constrained queries, limiting the finding conversation between a person and a Web site. Now, let’s contrast search engine results with hosted advertising results. Search engines providing hosted ads have no requirements for fidelity or specificity—the rules by which a site’s own search engine usually abides. By using an OR operator instead of AND, hosted ad servers can cherry-pick ads, displaying only the most relevant ads or those matching the most profitable keywords in a customer’s query, and ensure the ad server never fails to produce results. Also, when an ad only approximately matches a query, you can replace the ad’s title with dynamic text that exactly matches the keywords in the query. For example, in one particularly memorable usability study, a task asked participants to find a ticket to a performance of the Nutcracker in San Francisco, during the holidays. 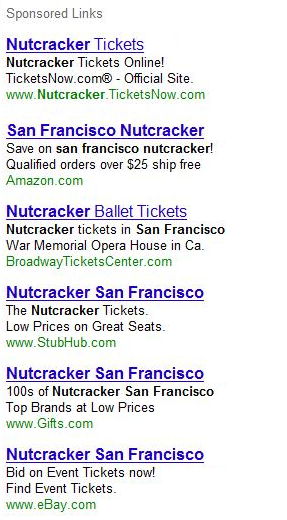 After reading the task, one participant typed the query Nutcracker Ballet in San Francisco December 1-31st, which, of course, matched no results on the site. However, the ad hosting engine produced a page similar to that shown in Figure 6. When there are no search results, that is the wrong place and time for displaying third-party ads. Upon seeing the no search results page displaying these ads, the participant promptly clicked an ad and bought a ticket from a competing site, even though cheaper tickets were readily available on the site we were testing. If the participant had relaxed her query, she would have discovered this, but instead, the third-party advertising appearing on the no search results page led her down a different path. When there are no search results, that is the wrong place and time for displaying third-party ads. As this story demonstrates, it is very easy to lose customers on no search results pages, which represent a critical juncture in a conversation between a customer and a Web site—an opportunity for the customer to reformulate a query and gain a deeper connection with your brand. Host third-party ads on your no search results pages only as a last resort. We recommend you carefully calculate the cost of doing so. Which click would generate more long-term revenue: the ad or the tools for query reformulation? Which click would ultimately engender more long-term loyalty and a better relationship with your customers? UX professionals should be actively involved in ad-hosting decisions to make sure your company’s golden goose continues to thrive, well beyond the current quarter. In his keynote speech at the 2008 Business Of Software conference, Seth Godin famously quipped, “Marketing is too important to be left to the marketing department.” The same goes for hosting advertising. UX professionals should be actively involved in ad-hosting decisions to make sure your company’s golden goose continues to thrive, well beyond the current quarter. We want to encourage you to use these ideas as a starting point for developing your own comprehensive merchandising and ad-hosting strategies. Making the tough choices that are necessary and getting creative with ad hosting is not easy, but it is an absolute must if your company is to survive and thrive in the current economic environment.